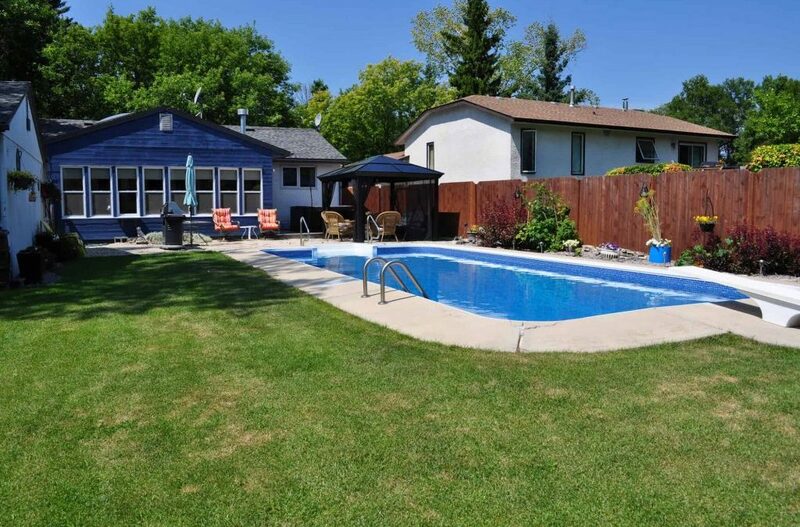 Set in the heart of Charleswood on a beautiful large 65×225 Ft lot backing onto a treed lot. This bungalow hosts 4 bedrooms and 2 full baths. Open concept main floor with newer blonde oak custom kitchen built with quality and high end appliances. New bathroom on main floor in 2015 with oversized stand up shower. Basement has large open recroom, full bathroom with jetted tub, gas stove and 4th bedroom. Oversized 24×24 garage and in-ground pool (liner 2016). Pool is 16×36 and 4ft (shallow) and 8ft deep (deep end). Also included is a nice gazebo and newer 6 person hot tub purchased in 2011 from Solstice Spa. Last but not least is a 4 season sunroom with all new windows, flooring and a gas stove. A very well loved home with newer tri-pane windows throughout, newer dual stage furnace 2004, AC 2007, roof 2006 (30 year shingles) and more than I can list! A house with a pool just in time for those awesome summer BBQs!